Hello beauties. I’ll be honest I’m terrible with eyeshadows, all that blending, however I have made it my mission this year to use my eyeshadows and get a great look too. Plus I’m a complete sucker for them. All those pretty colours. Just like lipstick. (I’m a self confessed lipstick junkie!!) I’m going slightly off topic here. Gonna give you beauties a small review on the two palette’s. 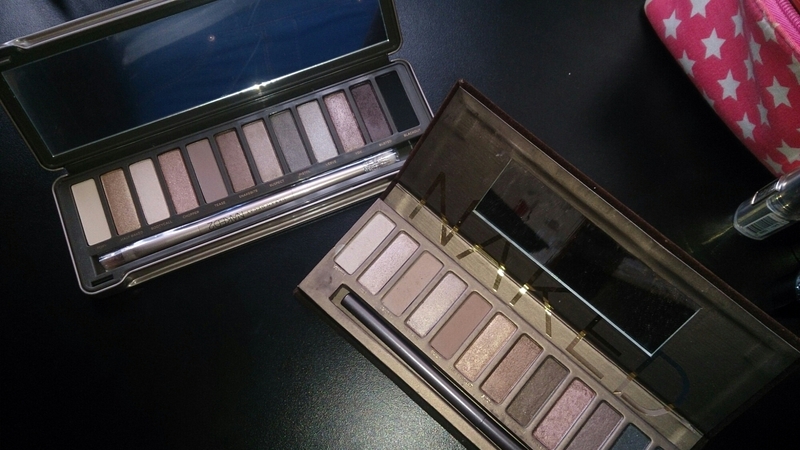 The Urban Decay Naked Palette both 1 and 2. My only problem, which is tiny, is the fallout. The tiny balls of product that form when you dab your brush in. I hate that. Feels like some of the shadow is getting wasted!! Posted in Beauty, Social MediaTagged Beauty. Makeup. Fashion. Next Post Artlovers. The Tools!! Absolutely in love with my Naked 3! ❤ I haven't tried the other two but I definitely want the first one because I'm more into warm as opposed to cool neutrals! Really?? I dont thing I have enough. I prefer nature shades round my eyes. I’m have to have a lookie at the 3rd palette. Ill have to have a lookie. It sounds lovely. Pink shades are great under some tones as a base coat. Gonna sweet talk my mum or partner now.